crafty goodies: Melon waters ~Pink Paislee!!! of the papers and loved the watermelons on this!! It was perfect for the story of these pictures. We carried watermelons from Texas to Indiana for these two kids. They call them "melon waters" and they love them. Tomorrow is a travel day for me and yep, I'm one year older today. Have a great day and I'll see ya soon!!!! Ohhhhhhh this is BEAUTIFUL!! 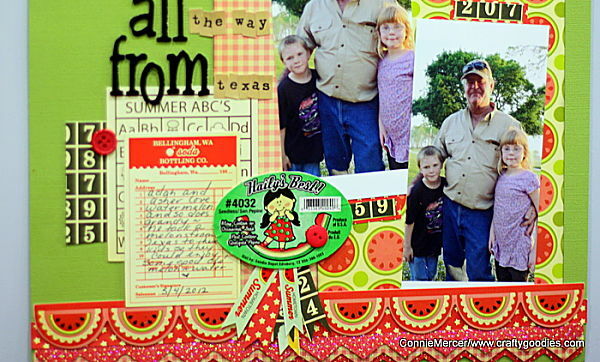 I love love love the colors and loveeeeeee that watermelon paper!!!!! Great layout...I love that you made the award out of the sticker on the watermelon!!! Happy birthday, Connie! Such a fun layout. Alexa used to call them wallermuttons. LOL! Happy birthday, Connie!! Hope you have a wonderful day :) Love the page - screams SUMMER!! I love the colors and you made a beautiful, fun page as always. 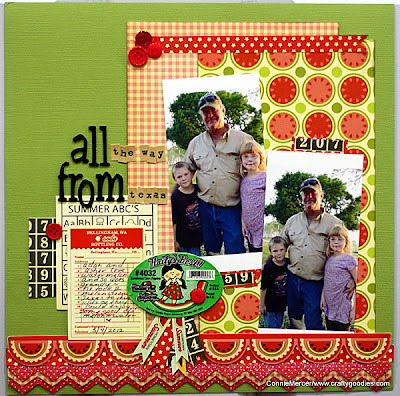 This is adorable with all the bright colors and of course your precious family photos. Happy, happy birthday to you:-) Hope you have a fabulous day!! wow so vibrant....a beautiful layout and i love how you kept the melon sticker and included it in your page. Such a fun and colorful layout! LOVE it! And, Happy B-Day!!!! Yummy! This is so summer! The award badge is great. This page is fabulous, Connie!! Love the way you used this line and their name for the watermelons is so cute!